Before we start, can we take a moment to appreciate how cute and pretty the box packaging is? This is why I am such a hoarder, there is no way I am throwing this adorable box! 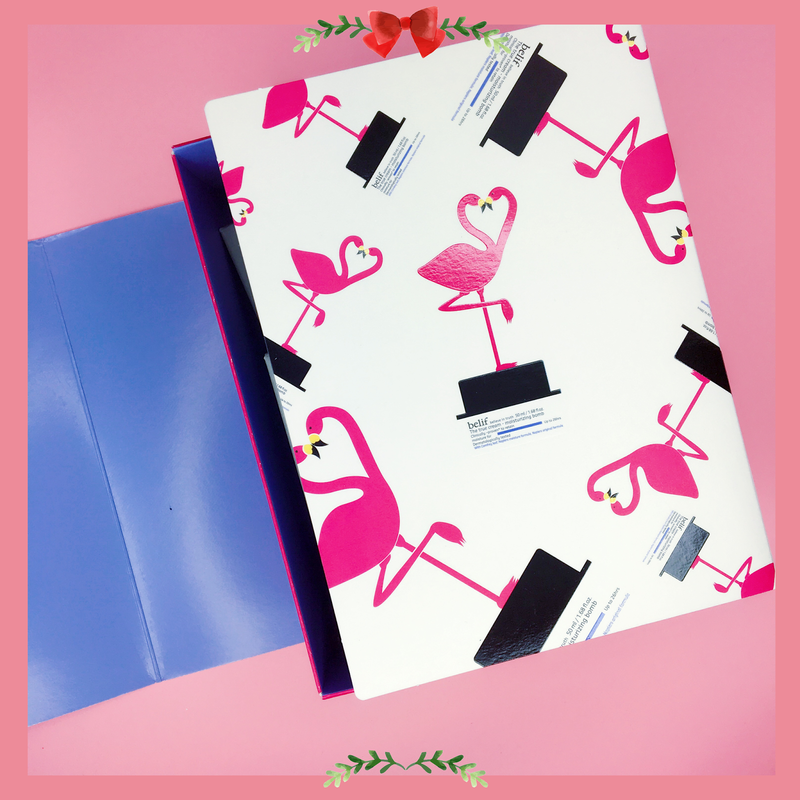 Super in love with the flamingos' design on it. I just appreciate how much care is given just to pack this box but I am not surprised. I've been following Belif's Instagram account for awhile and I just now that they like to take extra lengths for everything they do. Seriously, look at how beautiful their Insta-feed is! #instaapproved 👍 And pstt.. this brand have their own OST! Can't believe it? Check it out here! While using what they sent me, I also took my time to study more on the brand philosophy and I would like to point out that I am totally in love with how Belif uses 'apothecary'-like design in their packaging, for example of The True Tincture of Chamomile bottle! 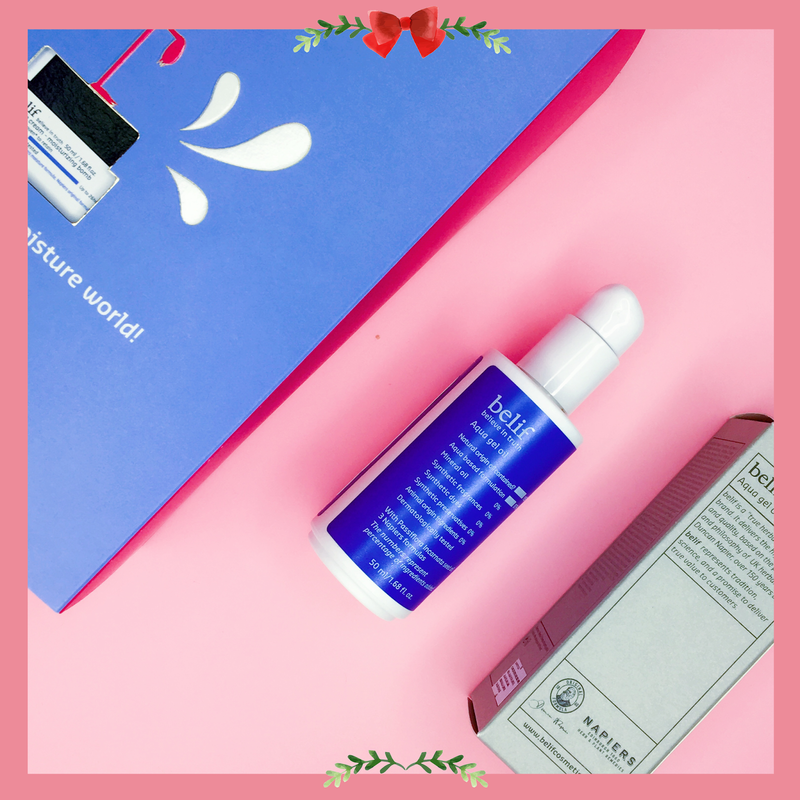 The product is not a part of this Christmas kit that was sent to me but I've been using it for quite some time now and I plan to write an in-depth review once I finished the bottle (which may take some time because I still have a long way to go). Belif emphasizes honesty and truth by using only superior quality ingredients for their products and only formulate them in the safest and most honest way possible. The brand uses the knowledge of traditional herbal processing method that has been passed on since 1860 by a British herbalist, Duncan Napier from Edinburgh, Scotland. His philosophy of ' the best raw materials created the most honest efficacy' has been followed and tailored by Belif to deliver the best kind of products to the customers. 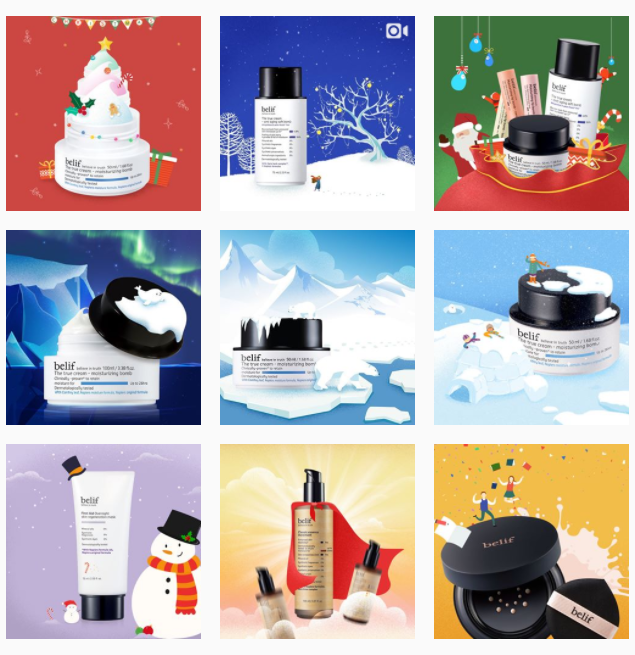 This brand believes in simplicity and sincerity when it comes to the brand image and their 5 promises to customers include 'true ingredients, true formula, true safety, true benefit and true timelessness'. 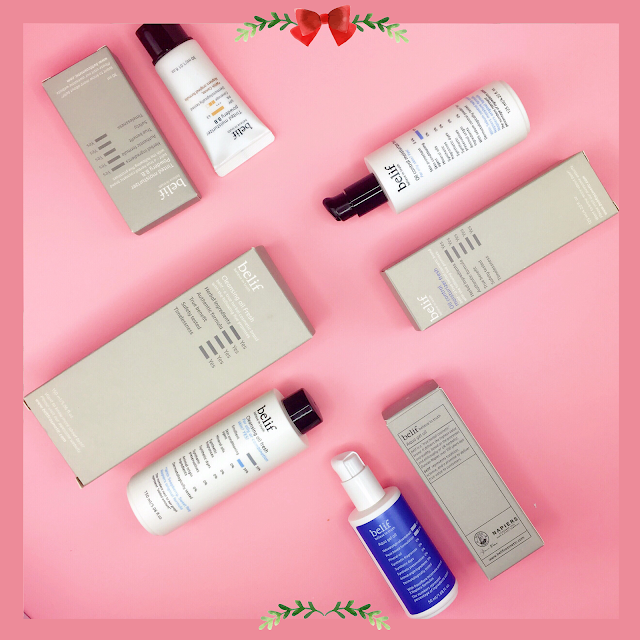 While I received four interesting products in this surprise box from Belif, the Belif Aqua Gel Oil is the first one to caught my eyes. Listed under 'special' product on Belif's website, it claims to help moisturise the skin without leaving unwanted greasiness on the skin afterwards. Formulated with 3 Napiers original formulas, this product does not contain any mineral oil, synthetic fragrances, synthetic dyes, synthetic preservatives, or any animal origin ingredients. According to my readings, the Passiflora Incarnata seed oil or also known as Passionfruit oil used inside this product is said to be beneficial to soothe and nourish dry, patched or irritated skin. It's been used medicinally for hundreds of years for its light, non-greasy texture, rapid absorption ability and fatty acid composition including Omega-3 and Omega-6 essential fatty acid. I find the information to be believable because when I first tried to use this product, once of it properties that I notice most is the ability to be absorbed quickly! The blue-ish colour gel has a very light texture and a light and calming herbal-ish scent to it. It does not feel heavy or sticky on the skin at all too. After applying this product, I can actually feel that there is thin layer of oil-like moisture covering my dry skin which I totally love! Usage direction: apply 2-3 pumps of this after toner everyday. For a natual makeup free of rougness and dead skin cells, you can also apply a small amount of it as the last step of skincare to balance it before makeup. Repurchase probability: Yes! 4.5/5 because I love how it feels on my skin. 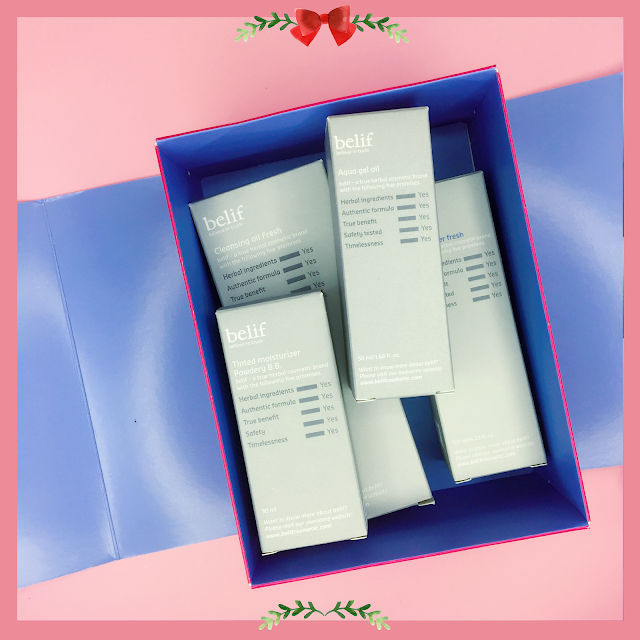 Like the Belif Aqua Gel Oil, the Belif Oil Control Moisturise Fresh also comes with a protective cap that will make sure there will be no 'accidental pumping' during travel etc. Specialised for those with oily skin type, the Oil Control Moisturiser Fresh gives off a light finish without any excess shine on the skin while keeping is moisturised with enough hydration the skin needs. With 4% of skin protectant ingredient, 83% of skin conditioning agent, and sebum controlling herb, this moisturiser are also formulated with Napiers Original Formula to help clarifying and hydrating the skin and Napiers Moisture Formula which is a herbal formula for oil-moisture balance. The star ingredient of this moisturiser is Rosehip extract rich with vitamins and tannins. On top of that, the oil controlling powder in this product help tightens large pores and improves skin's resilience, leaving it clean and smooth. Upon application, the product gets absorbed almost immediately and the light texture does not leave any stickiness on the skin even after awhile. I also notice that my pores becomes considerably smaller minutes after applying the product. Compared to the Aqua Gel Oil, this moisturiser feels slightly more watery and lighter which is why it is suitable for those with oily skin. It has a pretty similar herbal-ish scent to the Aqua Gel Oil which I am totally in love with. Usage direction: after applying toner or essence, pump 2-3 times into your palm and apply evenly over entire face and neck, moving outwards from the center. Repurchase probability: 3/5, I have dry skin so I might opt for other Belif products (been eyeing for their Aqua Bomb for awhile) instead but I highly recommend this to those with oily skin. It's super light and non sticky which is perfect for our humid and hot weather. Want that no makeup kind of look the Korean celebrities usually rocking but you have oily skin? You might want to try the Belif Tinted Moisturiser Powdery B.B. because its formulated to provide clear, translucent, and natural looking tone to make its application on the face looks subtle and matte without any appearance of oiliness. It has a medium coverage which is normal for tinted moisturiser as it's basically a moisturising cream with a tint to provide some coverage for the skin. This Belif Tinted Moisturiser Powdery BB comes with a basic SPF 43 PA+++ to provide protection from the sun UV rays to the skin. The star ingredient of this Belif Tinted Moisturiser Powdery BB is a flower from Carribean called Canna which has a natural ability to keep sebum at bay. I would like to note that although it is said to give out matte finish look, I found it to not be flat matte because I can see that it also gives a really subtle glow on the skin. Unfortunately, for those with dry skin like me, I don't recommend you to opt for this one because it tends to make the dry patches look more obvious right after application (well, the product literally use the word 'powdery' in it's name so I kinda figure out it'll turn out like this on my very dry skin). 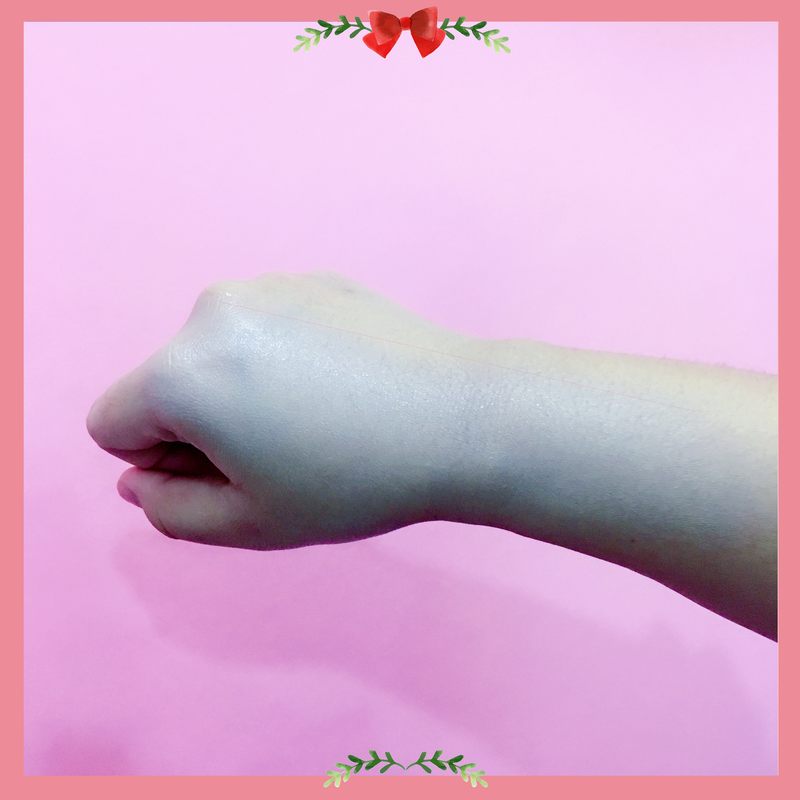 I notice that dry patches becomes less obvious after a few hours because the application areas starts to get slightly oilier after awhile which I guess is the work of the glycerin ingredient inside the product. Usage direction: as the last step of skincare, dispense a small amount, apply to the skin and gently pat for absorption. Repurchase probability: 2/5, to be honest this product is my least favourite in this bunch which is mainly caused by my super dry skin. I figure Belif Tinted Moisturiser Waterdrop BB will work on my skin better so I might give that a chance next time instead. Honestly, this Belif Cleansing Oil Fresh is probably one of the best cleansing oil I've tried to date! Suitable for combination or oily type skin, this product comes with a separate pump which I totally love because it means that I can bring it for travelling without having to worry about any leak. It contains 39% conditioning agent and 59% emollient which is for another term for moisturiser that makes skin become softer. It also uses Napiers Original Formula like Belif Oil Control Moisturise Fresh. The star ingredients of this product is Soapberry and Sweet Flag which helps to prevent future breakouts on the skin. A little goes a long way for this product and it feels very light on the skin. If you are used to double cleansing method, you'll know that some cleasning tend to leave a greasy film on the skin after being washed off with water but thankfully this Belif Cleansing Oil Fresh doesn't do the same. In fact, it feels super light on the skin. 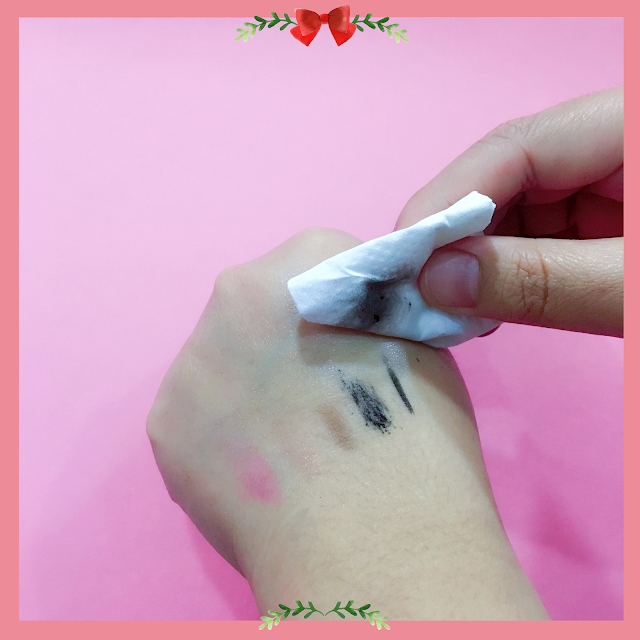 The oil also removes almost all kind of makeup that I use including the waterproof type. I am also super curious about how Belif claims that you can use this oil to remove blackhead by concentrating more on blackheads 'infested' area while cleansing but so far I have not seen any notable changes to it. Usage direction: pump once or twice in your palm and gently massage onto dry face, wiping away make-up. Concentrate on blackhead areas with special care, then rinse with lukewarm water. Repurchase probability: 4.5/5, most likely. I love it! In overall, I consider Belif to be more of a high-end brand of K-beauty when it comes to pricing and I find that to be reasonable considering their claim to be using only the best ingredients for the products. I also love the fact that their products are free from a lot of 'controversial' ingredients like mineral oil, synthetic fragrances, synthetic dyes, synthetic preservatives, animal origin ingredients etc. They are also dermatologically tested to ensure the customers safety is being cared of.